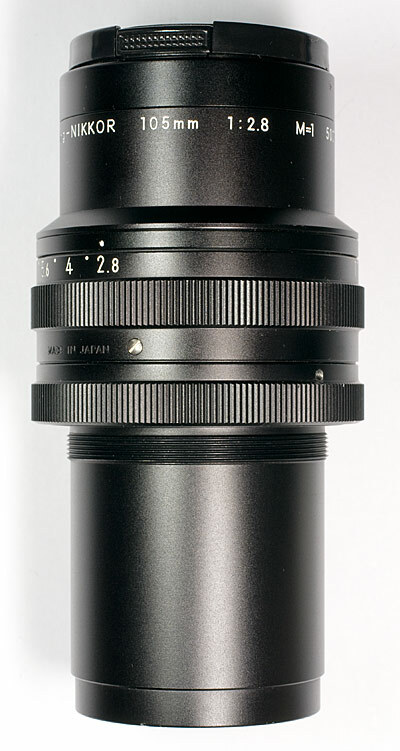 Lens Mount: M45 x 0.75mm. 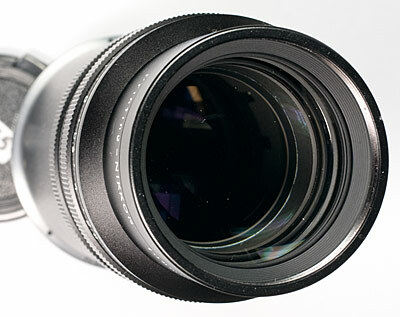 Needed Adapters: This lens has an unusual mount, kinda a 45mm T2 mount. A Rodenstock modular focus unit apparently works OK with it. The owner of this lens had a mounting adapter made for it that has a female 52mm thread on the back side. This will allow it to be mounted onto a standard reversing ring. The lens does have a built-in reversing adapter (M45 also). Street Price: $1000-$3000 in good used condition. Prices vary a lot online, shop around. I initially tested this lens at m=0.6 (no extra extension on the bellows). I found that this lens has its sharpest aperture at f/3.3 and the most resolution at f/3.3 to f/4.7. That is pretty remarkable for any lens, more so for a 105mm lens. 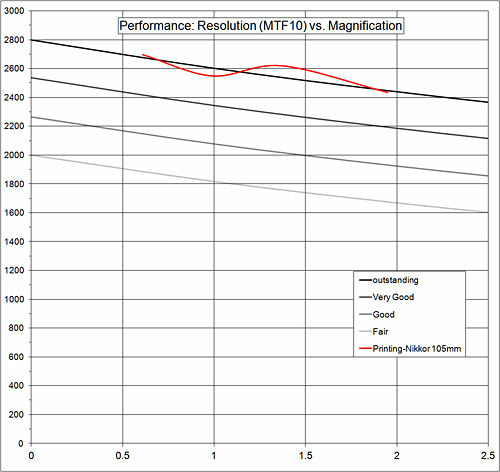 Since the lens is optimized for m=1, I also decided to do measurements at 1:1. 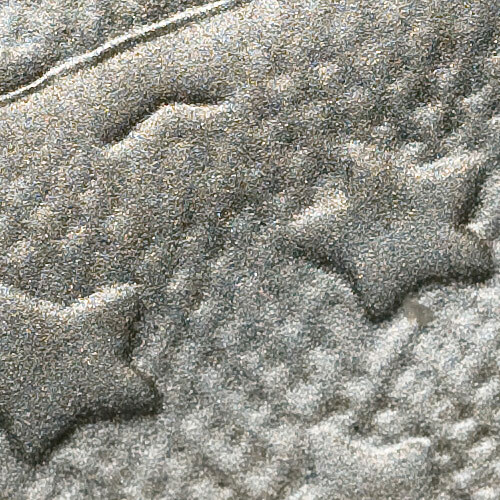 At this magnification it was sharpest at f/2.8 (wide open), even more impressive. 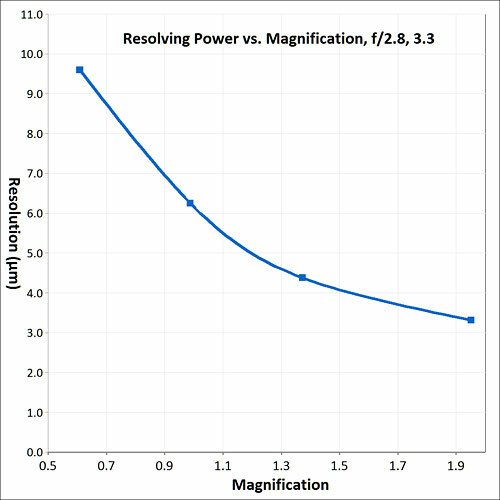 It resolves the most from about f/2.8 to about f/4.7. If you don't mind having little depth of field, go ahead and shoot at f/2.8 at 1:1, and a notch or two higher for other magnifications. Performance doesn't start to significantly degrade until you go past f/5.6. The corner performance of this lens is interesting. You can really tell that the lens is optimized for 1:1. The field is flat as a board at 1:1 regardless of aperture. 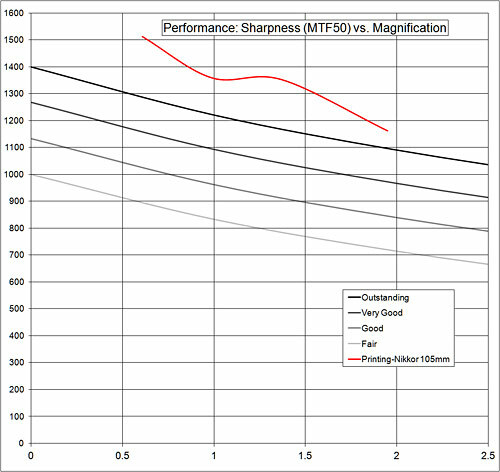 Once you stray away from 1:1, the field flatness starts to lessen (see the next graph). I would suggest that if you want reasonably flat field at any mag above or below 1:1, stop the lens down a notch or two. 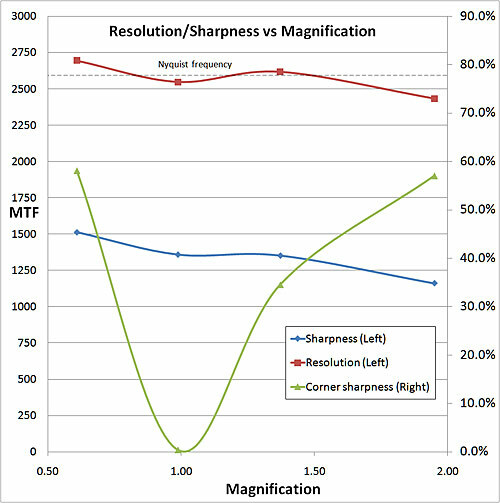 This lens shows the highest center of the field sharpness and resolution that I have measured across this magnification range (except maybe at the highest mag (m=1.95). 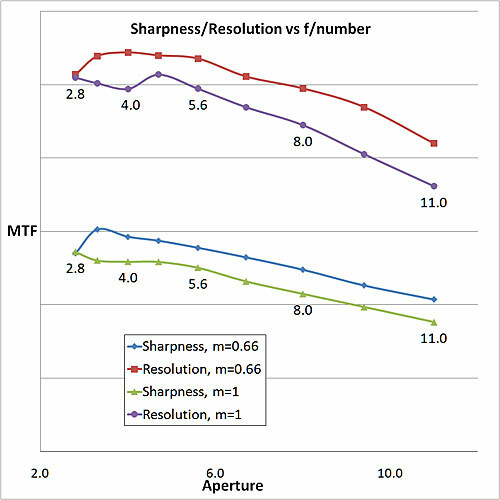 The only lenses that come close in terms of sharpness are in the 50 mm focal length range (55 micro AIS, 50mm sigma, Schneider 50/2.8 Componon), and they don't have nearly as long of a working distance. The interesting part for me is that the numbers dip slightly at 1:1 (I checked the numbers several times). Is the dip a slight concession on the part of the designers to get a flat field at 1:1? As referred in the last section, the field flatness is exceptional at 1:1 and not a great as you go above and below that magnification. I have 4 lines that represent levels of performance from outstanding (top) to fair (bottom). This shows where this lens fits into the hierarchy that I have created. The Printing-Nikkor 105mm shows outstanding sharpness performance across its magnification range About as high as I have seen over most of the range. The Printing-Nikkor 105mm shows very good to outstanding resolution performance across its magnification range. This graph represents the smallest details that are able to be resolved by this lens at various magnificaitons. If the number doesn't get smaller as the magnification rises, there is little benefit to going up in magnificaiton with this lens. This situation is also called empty magnification. Very good to outstanding resolution, no problems. his lens is a true apochromatic lens (very few are) and shows almost no fringing. The most unusual part for me is that there is virtually no longitudinal CA present (commonly seen as a red or cyan fringe of out of focus details, worst at large apertures). Longitudinal CA is difficult to measure, so I added an image done f/2.8 showing no visible fringing on out-of-focus portions of the image. There is also very little lateral CA present. 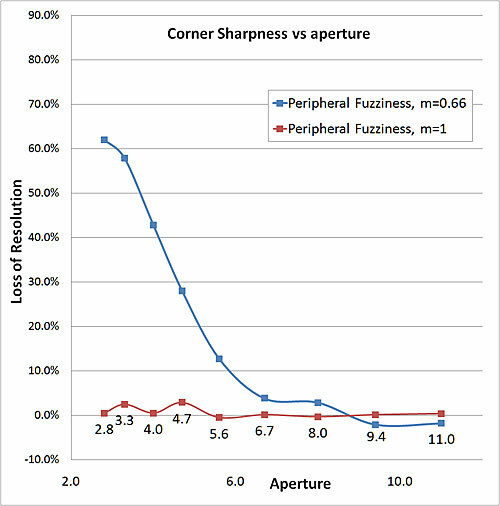 At 1:1 the CA measures less than 0.017% across all apertures (less than 0.04% is considered insgnificant, see Glossary for further explanation). 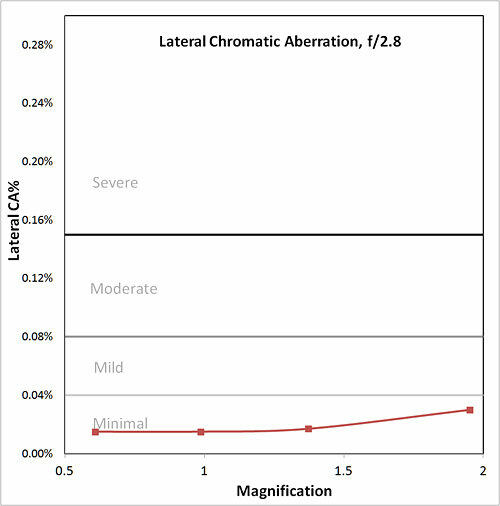 That lateral CA is slightly worse at other magnifications although it remains below 0.03%. Image Contrast: Image contrast is very good, similar to a modern macro lenses. Flare: This lens shows no significant flare during testing. Distortion: This lens shows no significant distortion during testing. 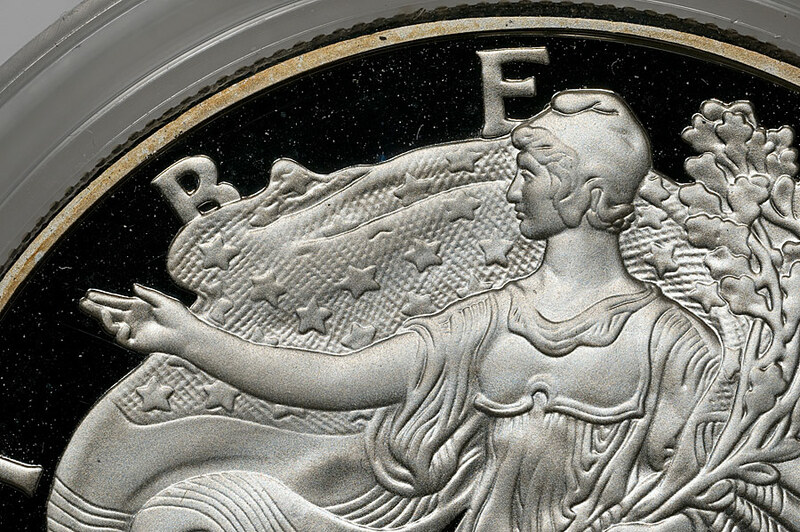 About 1:1 magnification, f/2.8, stack of 12 images, resized: At f/2.8 you have to image stack with a coin, even at 1:1, but how many lenses take this good of a picture at f/2.8 at 1:1? There is very good pixel level detail, no problems. This is an unusual and hard to find lens that is expensive and optimized for a narrow magnification range (optimized for 1:1) It is difficult to adapt to a camera, but it can be done either through a Rodenstock or through a custom adapter. The results are worth it, given a few caveats. This lens has exceptional resolution and sharpness, outperforming every other lens that I have tried from about 0.60:1 to 1.5:1. There is a slight dip in the sharpness and resolution at 1:1. The field is dead flat at 1:1, but the corner sharpness suffers a bit above and below this magnification. There is almost a total lack of distortion and virtually no chromatic aberration. Since it has a focal length of 105mm, the working distance is very good across the magnification. It has very good contrast, similar to a modern macro lens. This lens it at its best at large apertures and this is what separates it from all the other lenses out there. If you are willing to forego significant depth of field and you like imaging at 1:1, this lens can't be beat. You can use this lens at smaller apertures and it still outperforms most macro lenses up to about f/5.6. But most of the big advantages of this lens go away once it is stopped down (except low CA).